Want a fun alphabet game? Well, here you go. Alphabet tic-tac-toe! 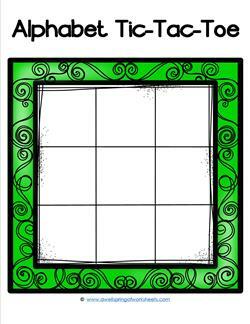 Use the worksheet, game boards, and letters on this page for an extra full dose of fun. The letters provided with this set fit the squares perfectly. 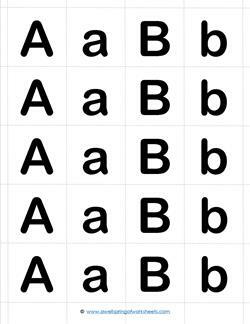 There are five of each uppercase and lowercase letter. Kids can use the same letter in both uppercase and lowercase to play against each other, or they can use one uppercase set and one lowercase set of different letters. They can play a few games and then trade the letters with their friends. 9 resources in color and black & white. Scroll all the way down for the letters! Go to this page for even more alphabet games! 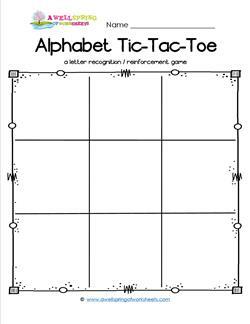 Now this is a fun alphabet tic-tac-toe worksheet! Use the letters with this set, or use classroom manipulatives that start with the same beginning sound instead. Well, we aren't boring on this page. You just click on this bold black and blue alphabet tic-tac-toe board and you just might win a game or two! Ha! Ha! Okay, so you're going to play alphabet tic-tac-toe, and you need some letters and you need something to play it on. Shazam! You've just come to the right place! Now here's a fun game! Alphabet tic-tac-toe! This orange frame, along with the other colors, can make it a tad more fun. Try it out. I'm sure you'll like it! Think Pink! This pink alphabet tic-tac-toe frame is sure to bring cheer & some fun times using alphabet letters to beat your opponent at this age old game. Here's one of our alphabet tic-tac-toe frames in a bright purple. Have your kids play with each other or with you! Great way to interact with the alphabet. Give this alphabet tic-tac-toe frame a try! This one is a bright colorful red with some curly accents. Perfect for kindergarten letter reinforcement. Please enjoy using this bright yellow frame with curly accents for a game of alphabet tic-tac-toe. What letters are you going use to play? Here's the set of alphabet tic-tac-toe letters to go with the alphabet tic-tac-toe frames. There are five of each letter - upper and lowercase.